Once someone starts working it is hard to find the time to go back to school. As someone who recently finished a part-time MBA program I can vouch for the time juggling required to do it successfully. Yet I always find some time to tinker which is great but there are benefits to having some structure to guide the learning. So when I learned about an online search engine development class early this year from a startup called Udacity I figured I would see what online courses are about. At the time I was doubtful I was going to do more than half of a session. What a surprise it turned out to be. If you have never heard of Udacity, it is a company that uses the internet to make computer science classes accessible to a broader range of students. My class was taught by Sebastian Thrun and David Evans who are professors at Stanford and University of Virginia respectively. After trying out a class session I left it alone and was going to forget about it. 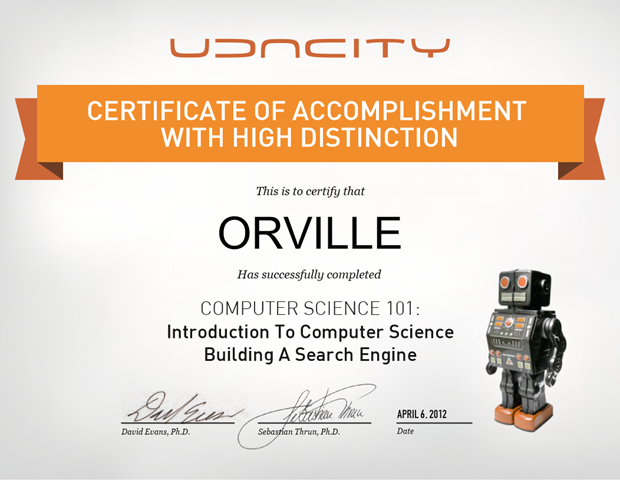 Then I received a reminder email from Udacity and the next session sounded interesting so I decided to check it out. With the light reminder emails, quizzes, and homework assignments I slowly got more engaged and invested time in the class. Before I even realized it I was going through the sessions (and sometimes the homework) each week. This class format worked for me for a few reasons. Since the lectures were online I was able to watch them whenever I had time. This could be during a break in the day or late at night. Since each session is broken into 2-4 minute nuggets it was easy to weave in and out throughout the day. Short quizzes tested my knowledge along the way. Sometimes I wouldn’t bother with the quizzes but if I felt that I wasn’t paying close enough attention I might try the quizzes to find out if I actually learned something or if I had the illusion of understanding. The course was pure fun. I enjoy pure learning so grades didn’t matter to me outside of making sure I was not suffering from an illusion of learning. Without the concerns of my transcript I could horse around and work at my own pace instead of sticking to the schedule. Discussions around online learning have been primarily focused on accessibility for people who are far away from a university or cannot afford how much it costs nowadays. I would also add that it is great for people who cannot afford the time that it takes to go back to school.